Dear Colleagues, Can We Please Stop Sharing These Things? Can we teach critical thinking and good digital citizenship practices if we don't use them ourselves? I'm asking because every week I see another educator in my social networks share a Facebook scam. Here are the last two that I saw shared by people who have administrative roles in schools. A posting by a page titled "Official Patriots Nation" that promised to give season tickets to a random person who shared a post. A quick look at the page itself would tell you it is not the official New England Patriots page. You can tell because there isn't an official Facebook verification check on the page. The other giveaway is that the only posts on the page were posts promising to give away tickets. No legitimate Facebook page exists just to give away expensive products to random people. 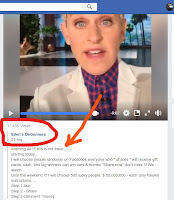 A posting from a page that claimed to be Ellen Degeneres giving away money to people who shared the post and wrote "money" in the comments. This scam is particular laughable because the person who created the page didn't even spell Ellen's name correctly. If that wasn't enough to make you suspicious, the first line of the posting is "Warning All!!! this is not fraud." That has the sound of a used car salesman saying, "this is a great car only driven by an old lady to church on Sunday/"
Please, if you work in education, stop sharing scams on social media. It just makes us all look bad. A New Gradebook for Google Classroom! One of the long-running complaints about Google Classroom that I and many others have had is about the nearly featureless gradebook. It appears that Google has heard those complaints and is taking some steps to improve the Google Classroom gradebook. The first step was taken this summer when Google added a comment bank to the Google Classroom gradebook. The second step came today in the form of an announcement of a new Google Classroom gradebook design. 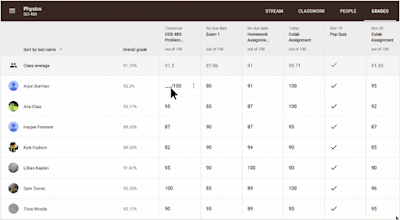 The new Google Classroom gradebook will let you see all of your assignments and grades on the same screen. As you can see in the screenshot below, you'll be able to see assignments listed across the top of a grid with fields for entering grades directly below those assignments. 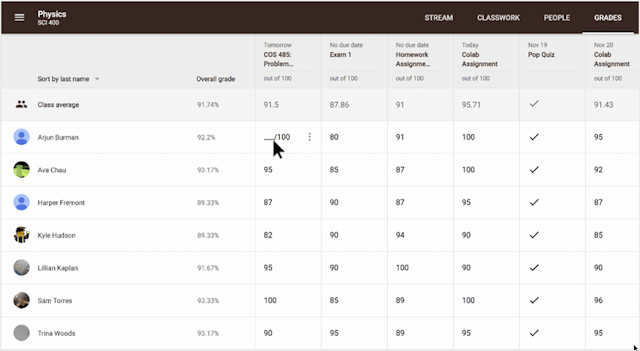 And you'll be able to see all of your students' overall course grades on the same page. Image courtesy of G Suite for Edu marketing team. The new Google Classroom gradebook is available through a beta program. You can sign-up for the beta right here. Back in June Google teased us with an announcement about a locked mode for Google Forms. All summer and fall I got questions about when it would be available. Today, Google announced that G Suite for Education users can now sign-up for early access to Google Forms locked mode. Sign-up here. Locked mode will allow you to restrict students to viewing only your Google Form while taking a quiz that you have given to them in Google Forms. GIF courtesy of Google for Edu marketing team. Before you get too excited about locked mode there are a couple of things that you need to know. The first is that it will only work on school-managed Chromebooks. Second, your Chromebooks need to be updated to Chrome OS 68. This is a presentation that I started giving at conference during the summer. It is increasing in popularity every time that I do it. Highlights of this presentation include incorporating augmented reality into outdoor lessons. This is a perennial favorite that includes quite a bit of audience participation in the demonstration of various formative assessment tools. This presentation is exactly what it says on the tin. I feature some of the best ways to get your feet wet with augmented reality and virtual reality in education. I also include a bit of research in these fields in the presentation. This presentation features five classroom video projects that you can do in a relatively short amount of time.